ill with a serious heart problem. Prior to Paul’s going to Houston for surgery, he sent us his database of information so that his work could be continued. additional pattern identifications possible. We are proud to share Paul’s work with you and request that if you have additional pattern identifications, you will share them with us so that the information can beprovided in turn to all ACGA members. 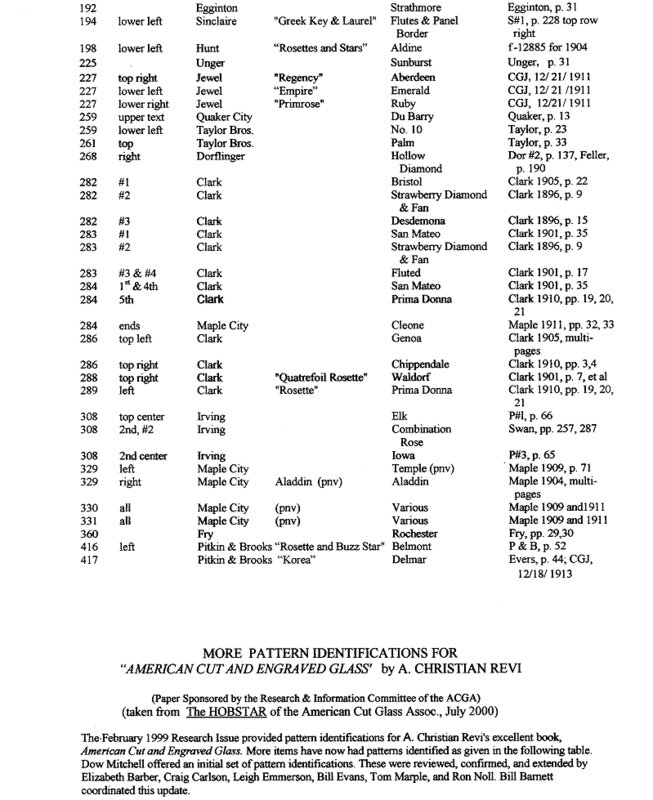 Our first paper deals with Mr. Revi’s excellent book, American Cut and Engraved Glass. 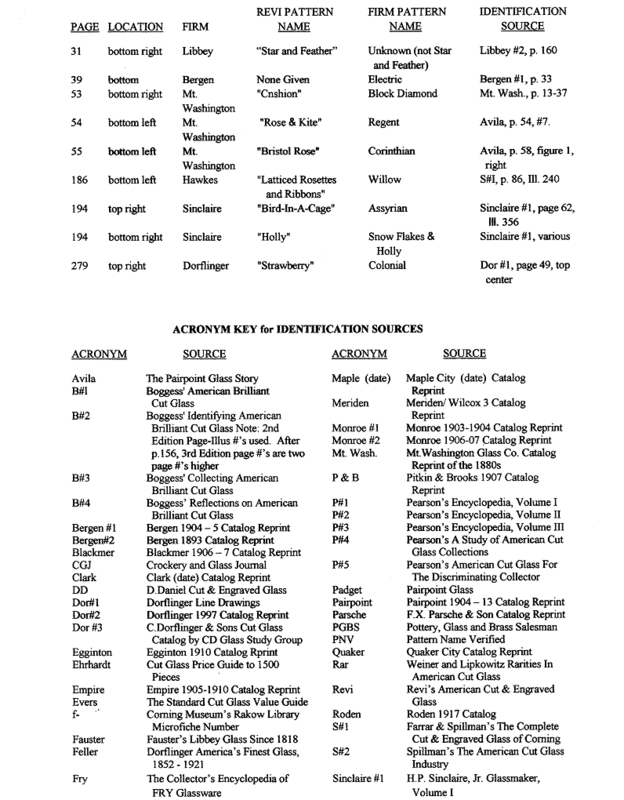 The following table of Additional Pattern Identifications lists the Page number in Mr. Revi’s book, the Location onthe page of the item being referenced, the Cutting Firm who produced the glass, Mr. Revi’s Pattern Name (in quotes when it differs from the cutting firm ‘s pattern name), the Cutting Firm Pattern Nameand the documentation Source used to identify the specific pattern. In order to conserve space, an ACRONYM KEY following the ID table defines the acronyms used in referencing the documentation sources. This Key will be updated as necessary and will apply to allfuture papers we produce. Once you get used to the “shorthand” method of identifying the various books and reprints, we are confident you will feel comfortable with the end product. For a number of years, Paul worked with Craig Carlson, Ron Noll, Tom Marple and other ACGA members on pattern identifications. As patterns were identified, these individuals would send them to Paulwho would review them. If Paul agreed with the pattern identification, he would send them to the other participants. Only after Paul received agreement from all of those involved, would he add the pattern to his list. A time consuming task, but in the end, a most rewarding one. We think we have developed a format that you will find easy to understand. We hope you will write the pattern names in your books (small removable paper labels are ideal) and that you will study thepattern and look up the Identification Source In this manner your pattern identification knowledge will be enhanced. 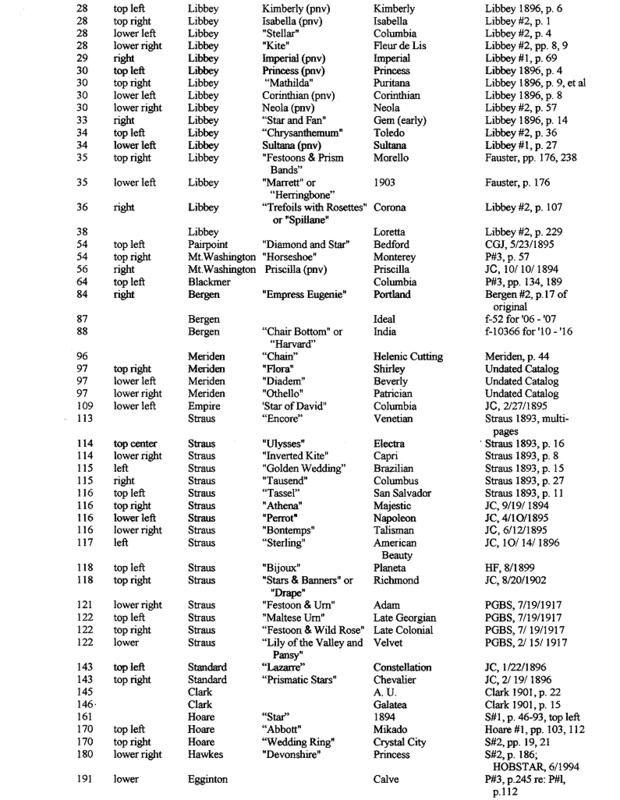 One word of caution though – pattern identification research can become habit forming.